A strong coastal storm system will produce a nasty combination of wind, rain, snow, surge, and surf across the Garden State Monday and Tuesday. Why is this storm called a nor'easter? Because of its storm track along the Atlantic seaboard, coastal storms such as this generally cause an extended period of northeast ("nor'east") winds. Usually these storms are associated with statewide heavy snowfall and blizzard conditions, but that will NOT be the case for the vast majority of the Garden State this time around. Live warnings, watches, and advisories for New Jersey. What warnings and advisories are in effect? A High Wind Warning, Wind Advisory, Winter Weather Advisory, Coastal Flood Warning, and Flood Watch are in effect for some period somewhere in New Jersey Monday. Rather than elaborate on the details and nuances behind each warning type, I'll refer you to the National Weather Service web site for more. When will the storm peak? 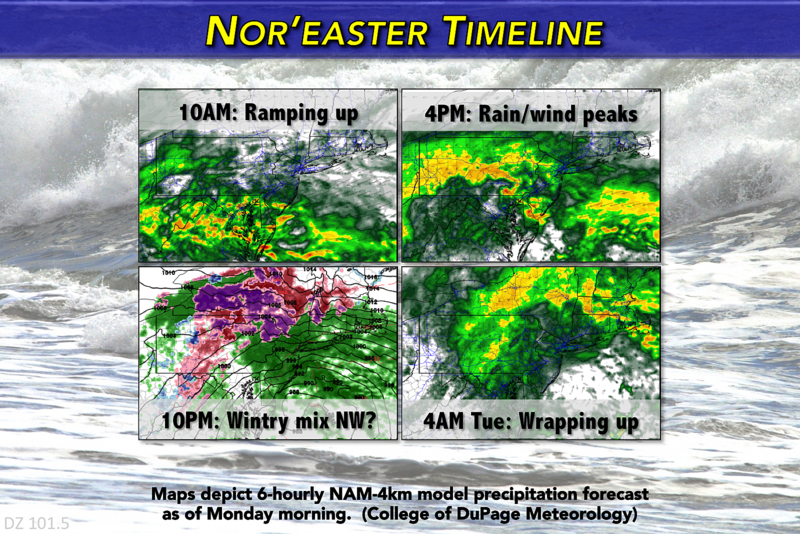 Rain and wind will ramp up Monday morning, peaking from Monday afternoon through late evening. What's your biggest concern regarding this storm? Hands down, the wind will be the biggest weather impact today. This is a very strong area low pressure, and will probably spawn damaging winds for a good chunk of the day. How hard will the winds blow? Gusts of 40 to 50 mph inland, and up to 60 mph along the coast. What can winds like that do? If you haven't secured your garbage cans and lawn furniture, do it now! Such winds are also more than capable of bringing down tree branches and trees and power lines. So, scattered power outages are possible. Controlling high-profile vehicles (trucks, buses, vans, large SUVs) may be very difficult with such a gusty wind. How much rain will fall? The latest models suggest up to 3.5 inches of rain may fall along the coast from this nor'easter. It's also important to note that some models have pumped out much less significant rainfall totals, less than an inch across the state. How will driving conditions be? It depends how unlucky your timing is. Travel might be challenging (or even impossible) during the period of torrential downpour and high wind Monday afternoon and evening. Low visibility, low traction, (as previously mentioned) low control of high-profile vehicles, and flooded roads will contribute to problems. Any snow to worry about? Yes. Probably. Maybe. Only in northwestern New Jersey. As temperatures fall to the freezing mark Monday evening, rain could change over to a wintry mix of snow, sleet, and freezing rain. The NAM model in particular is a cold outlier, showing accumulating snow extending north and west of the NJ Turnpike in northern and even central NJ. I've seen accumulations ranging from 0 to 8 inches. However, I am leaning heavily on the lower end of that range, limited to the area in and around Sussex County. What about storm surge and coastal flooding? Typical of east coast winter storms, those fierce east-northeast winds will push a lot of ocean water toward the Jersey Shore. Storm surge of 3 to 4 feet will be possible. That falls in the "moderate" coastal flooding category for tidal waterways up and down along the Jersey Shore. Which high tide cycles are precarious? Our next two high tide cycle will be the highest. Those will occur midday Monday and early Tuesday morning. Keep in mind, high tide occurs up to a couple hours later along back bays and tributaries. Will there be beach erosion? Yes, as 12-foot ocean waves batter beaches. When will the rain and wind end? Conditions will begin to improve statewide by sunrise Tuesday morning. Showers, clouds, and 30mph wind gusts may linger into Tuesday afternoon. What's next in the world of New Jersey weather? Sunshine returns to the Garden State on Wednesday, with mild high temperatures in the 50s. Our next cooldown looms near, however, as cold air starts to funnel in Thursday. The upcoming final weekend of January looks particularly cold, with some lows in the teens and highs only in the 30s. Even though temperatures will turn significantly colder, there are no big snow threats showing up through the first weekend of February (at least). Final words? Be smart and be safe, New Jersey. This nor'easter is no joke!